offer_teleport – Commands bot to send a teleport request to an avatar with a custom message (optional). If you have any questions or comments please feel free to leave a comment on the docs page! The following information is intended for LSL scripters who create devices using SmartBots APIs. 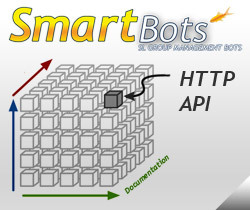 The SmartBots HTTP API documentation was stored in Google Docs previously. Now this documentation section has been moved to standard SmartBots docs to have unified look and feel. 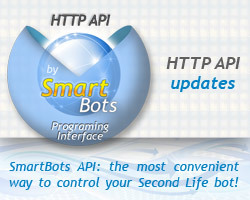 We are publishing the specifications of SmartBots HTTP API: the programming interface to control your Second Life bots and groups. move Second Life bot, interact with bot’s HUD devices and attachments. 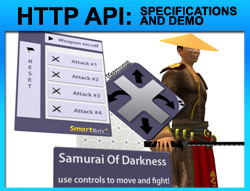 To show the possibilities of SmartBots API, we’ve deployed a demo battle arena with two remotely controlled bots – check the documentation page for details. The HTTP API specs are available here. We will expand the functionality and add more features regularly, subscribe to the blog updates!